Colocasia Fierce Gigante PP28,766 is one of the latest from our large growing Gigantes series. This massive plant is perfect for bringing attention to any section of the garden or large container. Mature plants can reach 5 to 7 feet in one season with large leaves growing 3 feet long and wide. Each leaf is dark green with a purple spot in the heart of each leaf. The petioles are a deep purple this purple runs into the veins under each leaf which creates a beautiful effect. The foliage is held upright to horizontally so that the veins can be see easily. Once plants reach maturity brackets of white flowers will emerge from the petioles. Colocasia’s are not often known for having ornate flowers but these are some of the most impressive and dramatic I have seen. White spaths often over 1 foot tall emerge usually in clusters of six flowers at a time. Each new petiole will produce more flowers and the over all effect is one of the best and dramatic Colocasias I have seen. 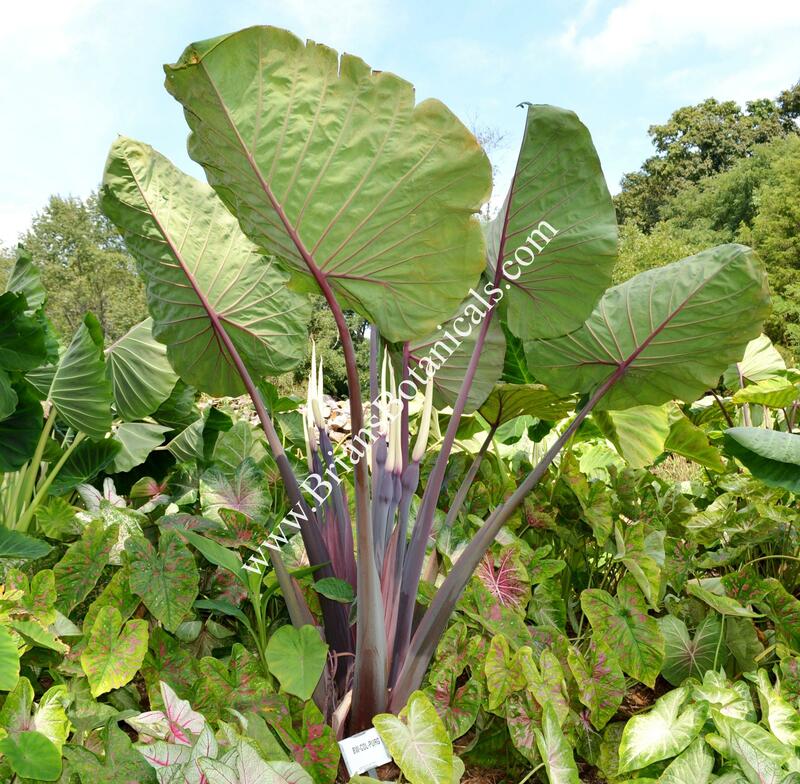 Colocasia Fierce grows best in well drained rich organic soil. Plants do best in full sun to part shade and should be watered regularly. A 4 1/2 inch potted plants can reach 5 to 7 feet in one growing season provided a good situation.